Knowing what is causing stress within your team. Ask questions and listen to the different insights and concerns your team is building around the point of concern. Build awareness within yourself as well. Find when your fears or temper is getting the best of you and spot stress-management techniques to improve your state of being. While some of your team may be very vocal about the shaky times your are in or that are beginning, some others may not be so engaged. Getting every team member on board in your organization will require reminding everyone that communication isn’t only encouraged, but a priority. Schedule productive meetings, have an anonymous comment and suggestion box, and remind every one of the confidentiality and protection policies you have in place. It is easy to get blindsided in a disaster. What keeps you in place is your purpose and end goals. While steering your organization forward may require flexibility it is important to always keep in mind what you are steering toward. 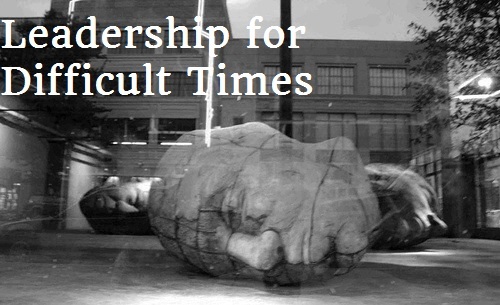 Tumultuous times often cause undue stress on leadership and team members. Relaxing the body and mind will keep your company’s spirits lifted. Host retreats, bring in healthy fruits, have a company potluck and remind your everyone to take care of themselves. Acknowledging challenges is a positive sign of good leadership within your company and a step in your journey of small business success. When the tough times arise, it is time for even more assessment, experience, and communication to ensure that you continue to fulfill your mission and vision.